In a time when we can order our groceries -- or even apportioned meals -- and have them delivered to our front door, it’s not hard to see that we’ve lost the connection to our food; Michael Pollan is grieving. 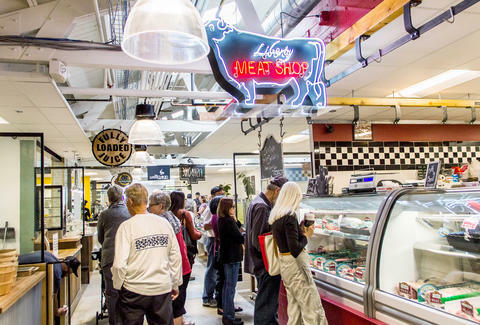 A place like Liberty Public Market is exactly what San Diego needs for us to get back in touch with what we’re eating. If you’ve spent time in cities like San Francisco, Boston, or Seattle, then you know a visit to their public markets can tell you a lot about the local energy, flavors, and foods of the region. They're hubs for townies and tourists to discover local food purveyors and shop for the freshest ingredients, from proteins caught or butchered that morning, to the ingredients you'll season them with. The foodie scene has been steadily growing in San Diego for a while. But up until now, the closest thing we’ve had to LPM is our beloved weekly farmers markets, or the Tuna Harbor Dockside Market, which is only open on Saturdays. Liberty Public Market, the result of two-plus years and $3 million, finally gives San Diego a proper permanent marketplace. It is easily the most important thing that's happened in our food scene in years. Walking into LPM, you’re greeted by a bustling crowd of people ordering, eating, talking. You're inundated with delicious smells from baking breads and pastries. Your first visit may feel overwhelming; it doesn’t take long to realize this isn’t like a trip to the grocery store, and it’s not supposed to be. These are your neighbors, working together and supporting each other in the pursuit of good, locally sourced food and products. Whether you’re looking for just a quick cup of coffee or picking up groceries for a dinner party, nearly 30 local artisan vendors housed in this 25,000sqft indoor-outdoor space have everything you'd possibly need, from the spices and sauces at Pacific Provisions, to the flowers that adorn your dinner table at AE floral. 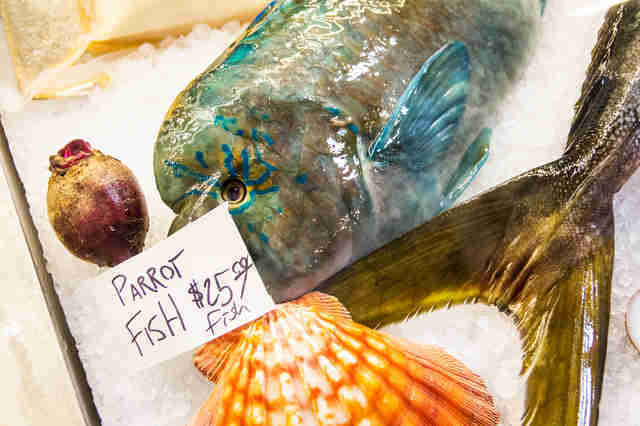 You’re not going to find the guys from FishBone Kitchen hurling fish at each other -- this isn’t Pike Place -- but this local fishmonger has a 12-seat raw bar where you can order oysters, ceviche, poke, and uni without having to dodge a flying parrot fish between bites. It also has whole fish available, and because of FishBone's dedication to providing sustainable, local seafood, you're definitely taking home the freshest daily catch. If all this fish talk has you wondering where all the other meat is, then check out the fresh cuts at Liberty Meat Shop. Look for the huge, unmissable, cow-shaped neon sign. Having grown up in his father’s Italian butcher shop in Little Italy, owner Tommy Battaglia is carrying on his family’s tradition of bringing quality meats to the San Diego community. 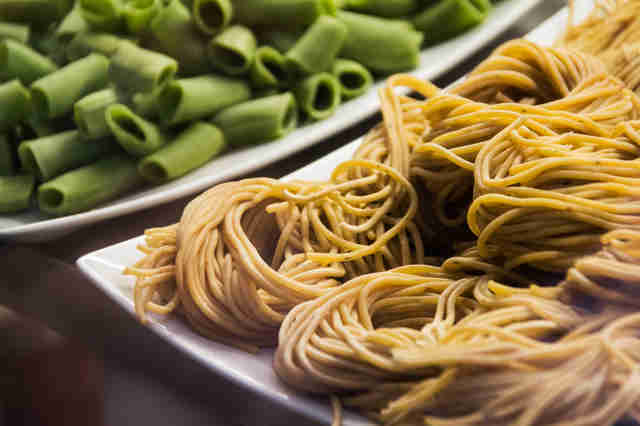 Wanna serve fresh pasta, but don't wanna make it yourself? Pick up pastas and sauces from Pasta Design instead. This husband-and-wife team uses the best semolina and durum flours, locally sourced, cage-free eggs, and organic flavorings and spices to make everything from risotto (pre-jarred with dried ingredients) to ravioli, all from scratch. Eat it with a slice of fresh-baked bread, pair it with a California wine, or sneak into the kitchen late at night and cut chunks right off the block. 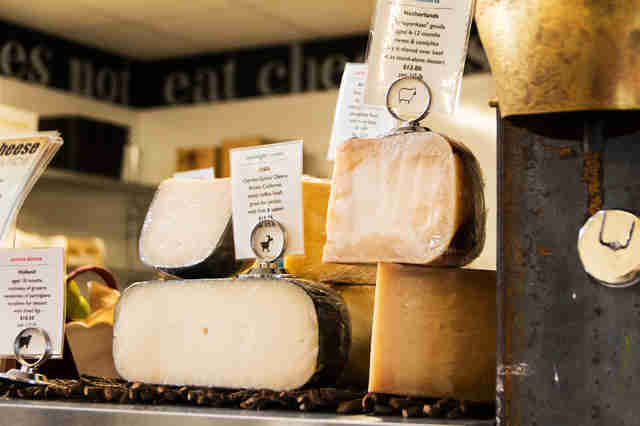 You can find more than a hundred of the best cheeses from all around the globe at Venissimo Cheese, from creamy bries to stinky Stiltons. Swing by for cheese boards, charcuterie, jams, picnic packs, and so much more. 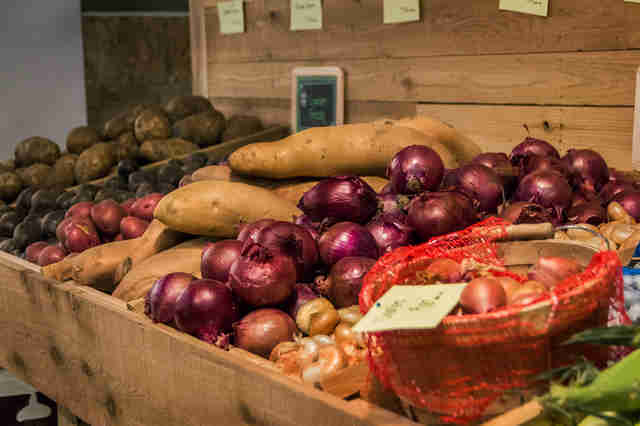 LPM has one-upped the farmers market with its Garden Fresh produce stand. It's sourcing fresh fruits and veggies from California farms, so the selection will be constantly changing with the seasons and what’s available on that particular day. There’s a sink and washing station so you can clean your produce, if you're itching to take a bite. How’s that for convenience? You don’t have to be a chef or experienced home cook to take advantage of what's inside Liberty Public Market. There are plenty of things to eat, from Maine lobster rolls and Southern-style gumbo to Thai dishes, tacos, and cheese-stuffed burgers (traditionally known as a Juicy Lucy). 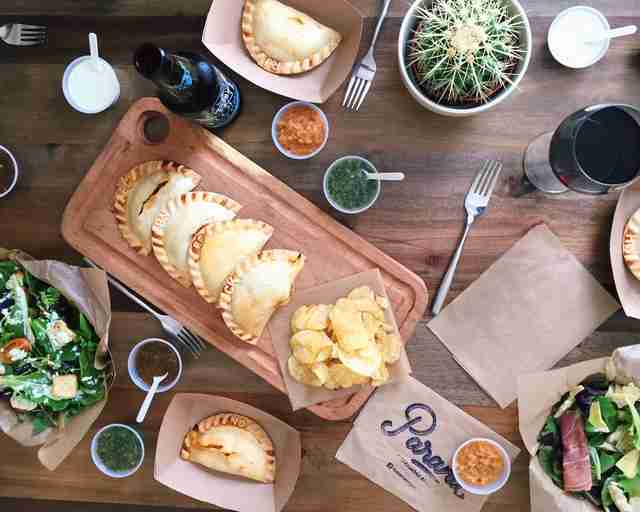 You’ll find local farmers market favorite Paraná Empanadas, the guys from the Mastiff Sausage Company food truck, and healthier options like cold-pressed juices and organic salads & wraps. 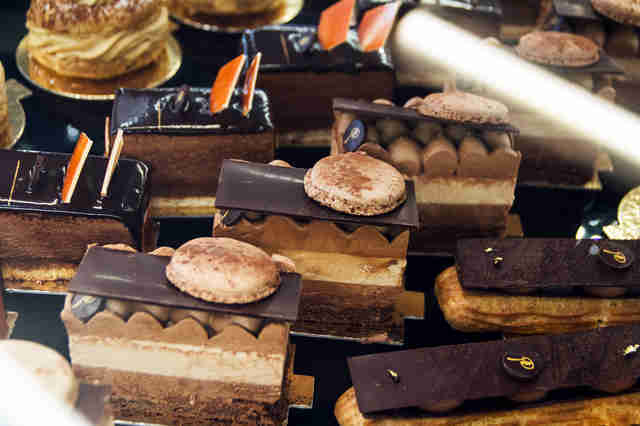 Try to avoid drooling on the glass when ogling the pastries from Le Parfait Paris. This French bakery serves everything from fresh breads and croissants to colorful macarons, and its desserts are as delicious as they are beautiful. 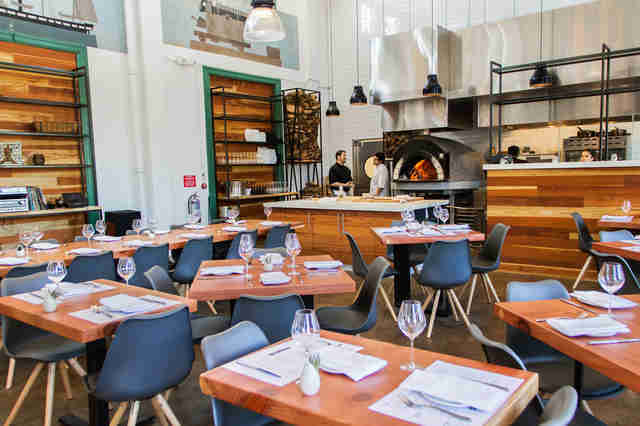 There's already a popular location Downtown, and now, thanks to LPM, there's one more place in San Diego where you can dine like a Parisian. 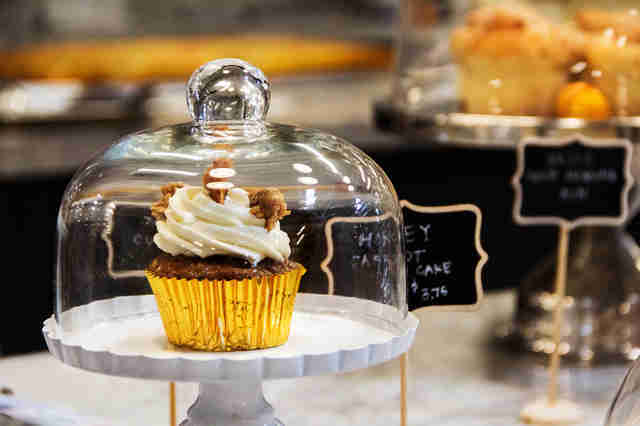 Speaking of desserts, Crafted Baked Goods will be the bane of your sweet tooth. Watch the pastry chefs in action as they whip up cakes, tarts, stuffed pretzels, and the house granola in the open kitchen. Sharing the same space is Scooped by MooTime Creamery; yes, like the one in Coronado. Now you can get your favorite MooTime sorbets and gourmet ice creams without having to cross the bridge. Proving that it thought of everything, LPM has a liquor license, and that means San Diego’s beloved Bottlecraft beer shop gets to set up its third location inside. 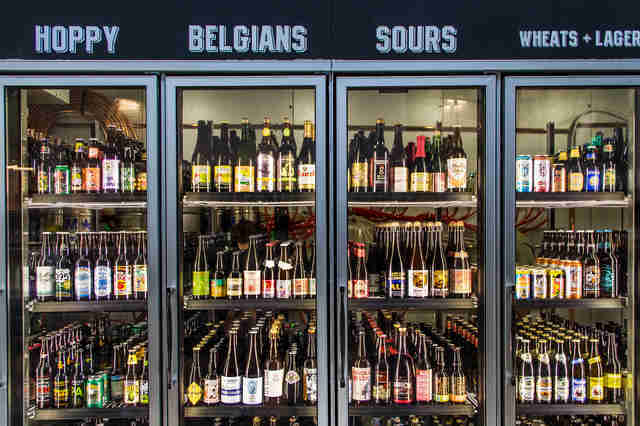 Sit at the tasting bar and sample all of the 24 specialty brews on tap, or grab a bottle from the cooler. 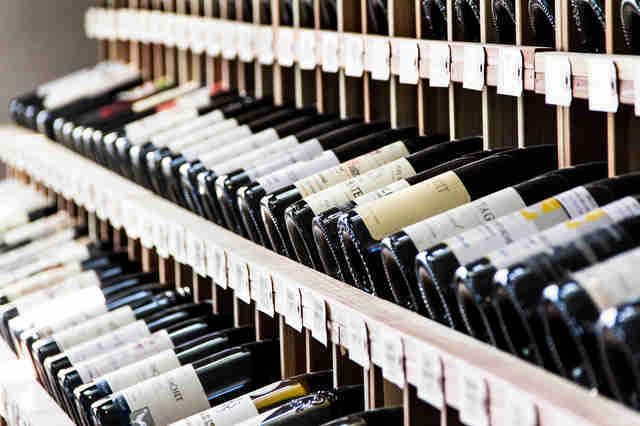 If beer isn’t your thing, the Grape Smuggler has 5,000 bottles of wine to choose from. This wine bar has a changing list of vino by the glass or in flights, and daily tastings. The wines are organized along the wall by region, with around 500 selections available from around the world. If you’re looking for a more traditional dining experience, then take a seat in the Mess Hall, where executive chef Tim Kolanko is preparing “market-to-menu” dishes. Bringing the LPM concept full circle, Kolanko sources nearly all of the ingredients for his menu from the vendors in the market. Dinner is served here Wednesday through Sunday, starting at 5pm. There's also Sunday brunch from 10:30am-3pm with a Bloody Mary cart, and Sunday roast, a three-course prix fixe menu featuring slow-roasted meats and fish cooked in the wood-fire oven, from 5pm onward. 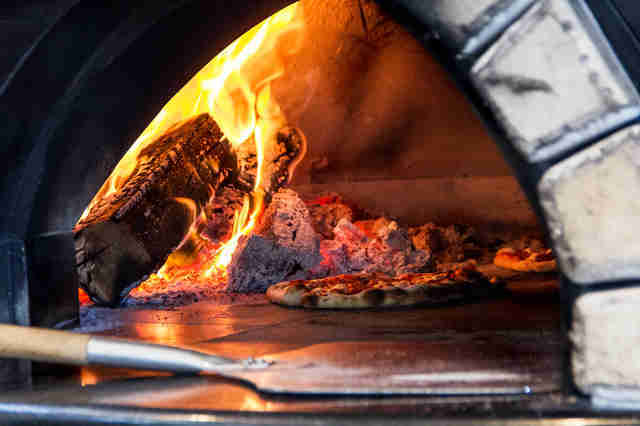 That wood-fired oven makes incredible pizzas, too. There are five to choose from on the menu, like the romesco, cauliflower, and manchego, or the créme fraîche, caramelized onion, and bacon. 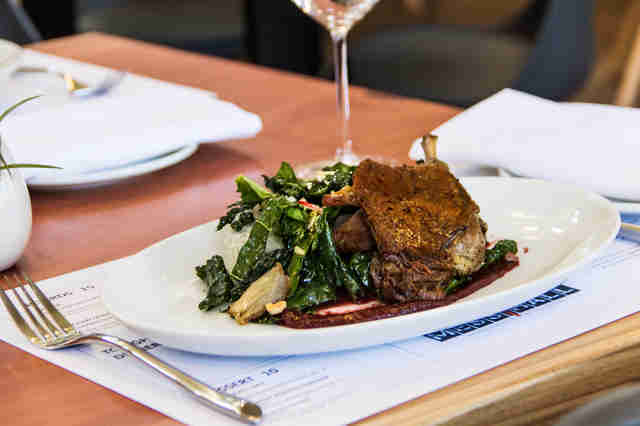 If you want proof of the market's potential, then order the duck confit with greens & cherry apple mustard -- all sourced from LPM's purveyors. The food isn’t all about the proteins and pies, though. With ingredients from the market, chef Kolanko creates colorful dishes like this salad full of locally sourced produce. One half of the Mess Hall may only serve dinner, but the other half has a full bar and lounge area where you can get lunch or dinner any day of the week. 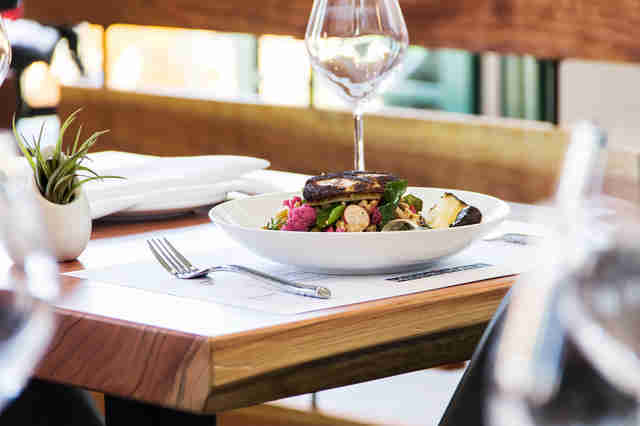 If you look closely at the menu, you’ll see suggested beer and wine pairings for each dish from certified sommelier and general manager Tami Wong. LPM really has thought of everything. 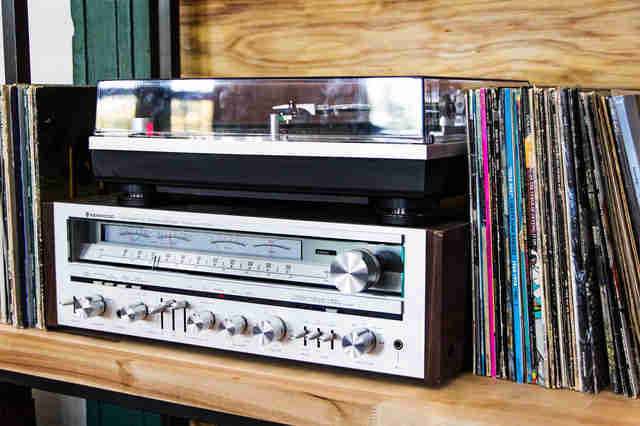 If you’re feeling the groove during dinner, thank chef de cuisine Colin Murray and his massive record collection. The vinyl classics from his personal library bump throughout the Mess Hall via an old-school Kenwood record player. 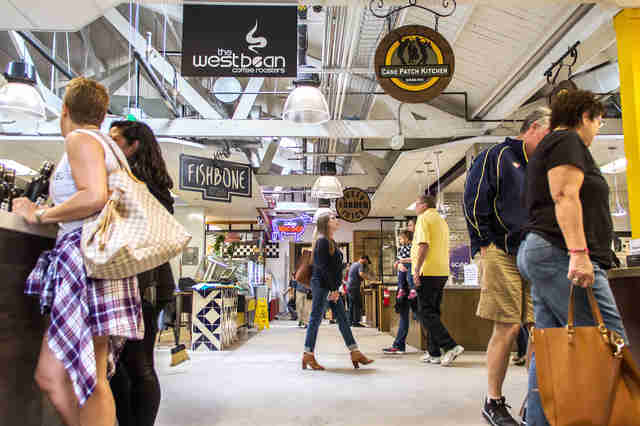 Not only is Liberty Public Market making history in San Diego, it's also preserving it. 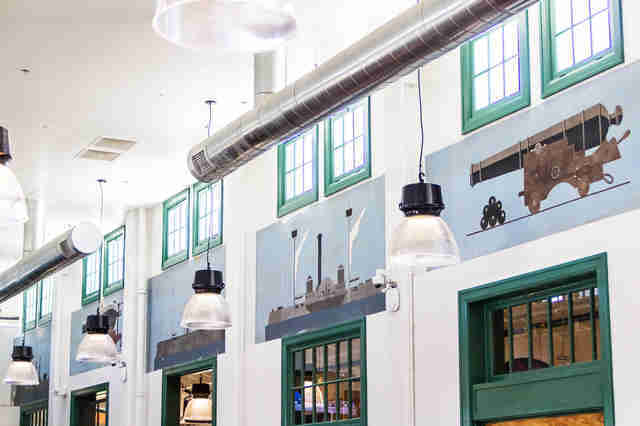 This space was built in the '20s as the original commissary for the former Naval Training Center, and if you look around the new Mess Hall, you’ll see that it kept the original paintings that have decorated the walls for decades. 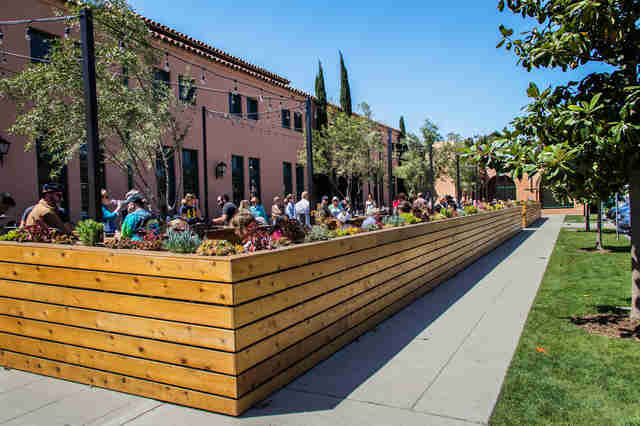 San Diegans love outdoor patios, and LPM has a massive one. 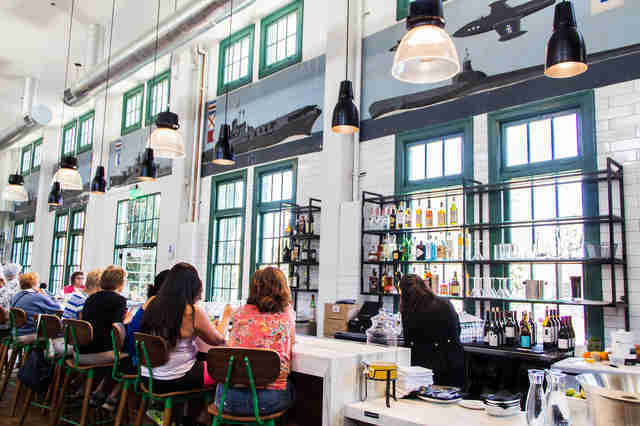 While there’s always an option for sit-down dining service inside the Mess Hall, the 3,000sqft patio is the perfect place to take a load off in the sun while you enjoy everything the market has to offer. Sara Norris is a photographer and writer who is determined to eat something from every vendor in Liberty Public Market. Follow her at @saraknorris.